Upper Noe Recreation Center staff wishes everyone a merry and safe holiday season. Online registration for classes begins December 12 at 10 a.m. To avoid any glitches, just remember to wait until 10 a.m. to sign on. Upper Noe Rec Center opens at 9 a.m. Staff is happy to assist with registration. They will give out numbers starting at 9 a.m. to any early birds who line up and wait patiently. Thank you. See www.noevalleyreccenter.com to find out how to register and to see the list of classes offered at Upper Noe this winter. Not all activities require registration. Just drop by and drop in on any of a large number of activities. Qi Gong, Yoga, Zumba, Volleyball, Tango and the list goes on. Some require a small per session fee but many are absolutely free. In addition, Open Gym hours provide hours of court time for pick-up basketball games or practice. From December 21 through January 4, workers will be hard at work refinishing all of the interior wooden floors, mainly the gym and auditorium. Health concerns require that the building remain empty until all of the fumes dissipate. Sorry, for the inconvenience but this work is long overdue and vital to keeping the surfaces safe, playable and attractive. Additionally, a brand new scoreboard was just installed and will be used for the upcoming Futsal and Basketball leagues in January. 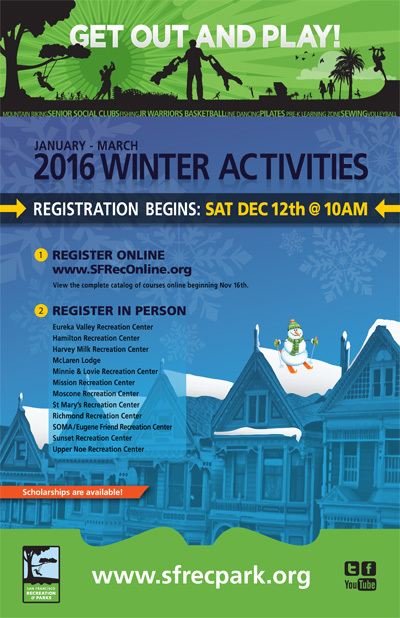 Get out and play with Winter programs and check it out. St. Mary's and Moscone are also having their floors re-done. 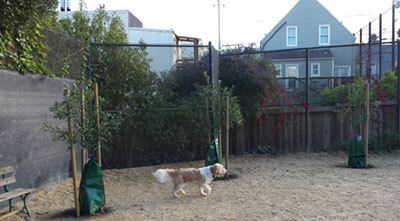 The closest alternative indoor gyms are Potrero Hill, Eureka Valley and Mission Rec Center. The outdoor basketball court here at Upper Noe will remain available. Tots who enjoy zooming across the floors during Auditorium Free Play are looking for a new ride. Their ride-around push cars are wearing out. Rec Center staff is seeking donations, especially of any Little Tikes cars. They hope to introduce the new toys when the Rec Center reopens in January. Infant and toddler books are also appreciated. Bring your donations to the Rec Center. If it is closed, contact Chris at chris@noevalleyreccenter.com for pickup or drop off. Our Ladybug Gardeners leader, Joan Lionberger, sadly reported that her husband Mike passed away in September following a long battle with health issues. 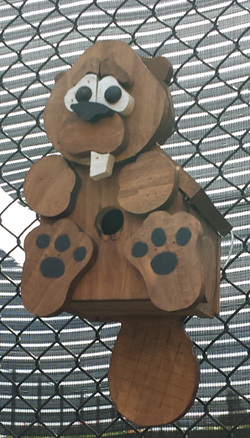 Many of you know Mike through his works around the Rec Center, all of those cute and quaint birdhouses that brighten up the grounds. 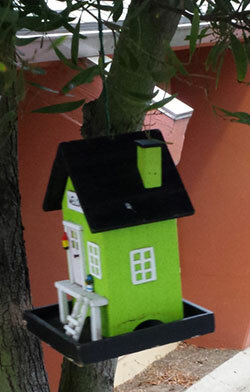 Mike’s birdhouses have come down for the winter for repairs. 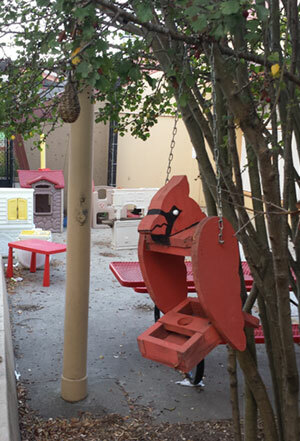 A children’s birdhouse building workshop in his honor is in the plans at Upper Noe for sometime before the spring. Mike was an inspiration. His kindness and charitable gifts of time and craftsmanship to our community will be sorely missed. A forest has sprung up in Joby’s Run. Long running efforts to bring beauty and shade to the eastern end of the park have come to fruition with the addition of five small trees. The placement was chosen to enhance the feeling of destination and to provide a softer buffer to neighboring property. Thanks go out to our new gardener George and his staff for all of their hard work and loving care to the Upper Noe grounds.